It feels like I’m in East Africa again. For a number of reasons: the quiet beaches, the tease to no end culture, the centrality of community and family, the love for music and food but above all because of time. Time – we all manage it differently based on where you live. Here, there is certainly more of a tendency to treat time as if it were an old friend who won’t be bothered waiting for you while you do the old round of catching up around the block. Time has easily been the theme of today. From this morning, when breakfast was postponed because the main dining room was flooded, and had to be tended to. To the afternoon when two northern Italians staying in the area for holiday put themselves to stress far more than I because the moto taxi did not come to pick me up at the said hour. 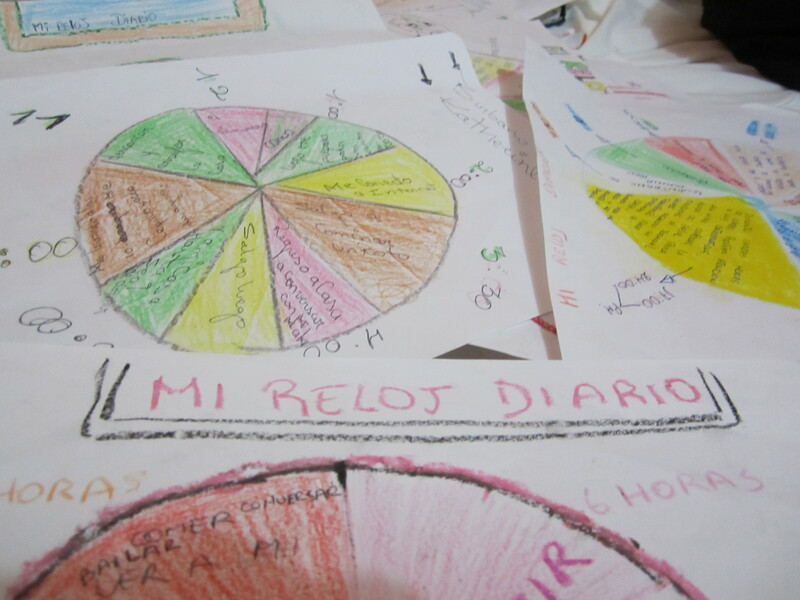 To our workshop today, focused on none other than time management and had participants drawing their 24 hour clocks. Their days consisted of sleeping full nights, passing time in the street, on facebook, studying, working or spending time by the beach. What you don’t get to see within the clocks is the flexibility of those activities, the impromptu decisions, the come and go. I only realized it when one girl included the workshop in her clock, which she explained as having become part of her routine. So this made me think about how in fact this workshop and me fit into the lives of these individuals. ‘Ya viene!’ (he’s coming!/on his way) are easily the words I have heard the most since the beginning of my time working with the group in Palestina, Rio Verde. These words would often be called out as a person leaves the workshop room to go do something for ‘un ratito’ (a moment), only to be seen again a half hour later or never again that day. It became an amusing symbol of the lax attitude to time and responsibility. Despite what some may say, to me it did not mean that they don’t respect time or responsibility. Rather, this to me meant they are a fluid part of community life. So if they are asked by their father to help at work- they go, or if water needs to be picked up from the neighboring town they commit themselves to having it done. They are sown into community life the way the land and sea have a give and take relationship. In this way of life you are never ‘too busy’ to properly greet a neighbor or exchange jokes with the person waiting next to you at the bus stop. You are also openly invited to get huffy at someone (particularly and more commonly if you are a woman) and have it bear no affect on the friendship you hold with that person. It is a way of expressing yourself and there is an understanding between everyone that allows this fluid dynamic to hold. So when someone shouts out a ‘ya viene’ I laugh – knowing that they are carrying on with their lives and happy to feel my presence was not an interruption. More than that, I smile because with their day-after-day presence in the workshop they are in a small way, like the girl and the clock exercise, inadvertently taking the decision to make this part of their lives.